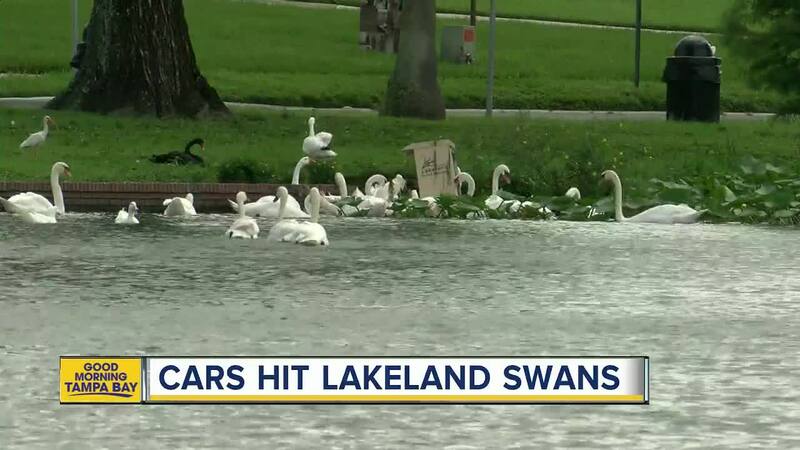 LAKELAND, Fla. — Six swans have been hit by vehicles in a matter of only three weeks, only one survived. The majestic birds are a staple of the City of Lakeland. Now, neighbors are demanding action to save the swans. “It’s just unique, they’re precious,” Cody Roberts said. Roberts and his wife are new to the area, but can already often be found feeding the birds down by Lake Morton. Like other neighbors around the area, the couple has already started collecting swan memorabilia and art to decorate their home. “They are just beautiful and sweet,” Roberts said that the swans were a big part of why they chose to move to Lakeland. According to Lake Morton historians, the regal swans come from across the pond. Not Lake Morton, but the Atlantic Ocean. As the story goes, a Lakeland resident, originally from Europe, knew about Queen Elizabeth’s famous swans. So, she requested to purchase the birds and the Queen agreed. The City of Lakeland were required to pay for the capture, crating and transfer of the birds and they were brought to Lakeland in 1957. So when the swans started coming up road kill in the last few weeks, it ruffled many resident’s feathers. “It’s just sad,” Cody Roberts said. One of the six birds was lucky enough to survive a hit-and-run. ABC Action News checked in on it, while it is recovering at Companion Animal Hospital in Lakeland. “He’s just kind of scraped up a little bit,” Dr. Patricia Mattson, with Companion Animal Hospital said. Mattson is tasked with taking care of the city’s swans along Lake Morton and Lake Mirror. She said this specific swan suffered a bruised wing and loss of feathers from its run-in with a vehicle and will likely be released back to Lake Morton this week. 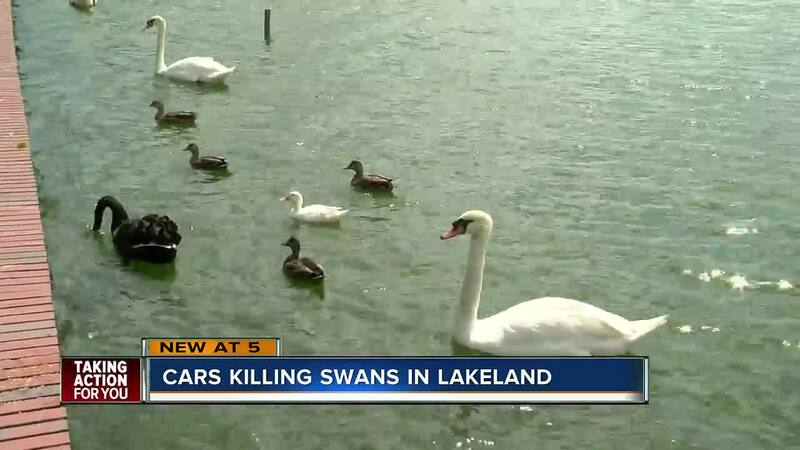 The other swans though suffered slow and terrible deaths. “They aren’t really afraid of anything including moving cars,” Brinkley Roberts said. Residents think speed and distracted driving are to blame. That is why the city now has a speedometer positioned at the lake, to remind drivers to slow down. “We could put up signs and make people realize that even if they don’t see it on the news that what they are doing has consequences,” Roberts said. The city will meet with Lake Morton residents on Thursday to address traffic concerns.